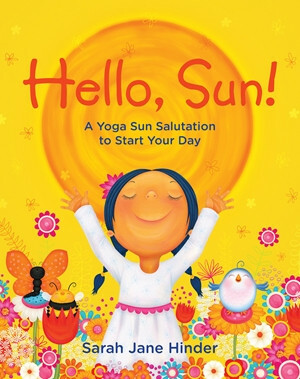 The first picture book to introduce young children to yoga’s beloved sun salutation flow. Step back and gaze forward, saluting the sky. Sarah Jane Hinder’s wonderful new picture book guides kids through a morning sun salutation yoga flow. The latest from the co-creator of the beloved Good Night Yoga and Good Morning Yoga series gives children a great way to connect with their bodies and calm their thoughts before jumping into the adventures of the new day. Sarah Jane Hinder’s bright color palette and playful illustrations are filled with nature imagery and fun details for children to find. Beginning and ending with Mountain Pose, children follow along with ten classic postures as they learn to breathe, stretch, and greet the day. For parents, grandparents, teachers, and childcare providers, Hello, Sun! is a heartwarming way to introduce our children to the wonders of yoga, and help set them up for a happy, mindful day. Includes a complete illustrated flow of poses, as well as a brief history of Sun Salutations and a special Sunshine Meditation.